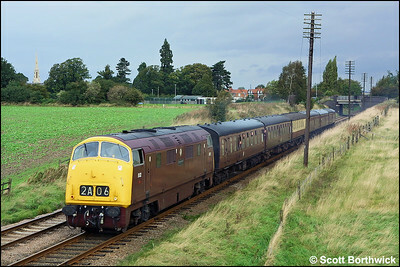 D832 'Onslaught' passes Woodthorpe in less than ideal weather on 18/09/2004 during the GCRs Autumn Diesel Gala whilst in charge of 2A06 1000 Loughborough-Leicester North. 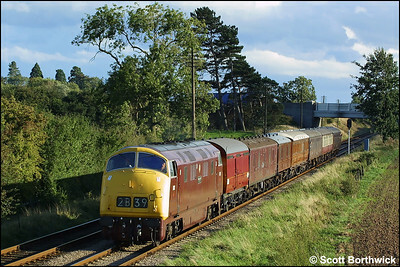 D832 'Onslaught' passes a Class 101 DMU at Woodthorpe whilst working 2A39 1630 Loughborough-Leicester North on 18/09/2004. 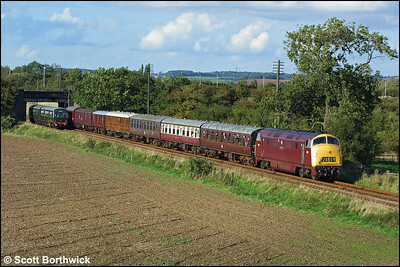 There is just a hint of autumn as D832 cathes the setting suns rays at Woodthorpe whilst working 2B39 1710 Leicester North-Loughborough on 18/09/2004. 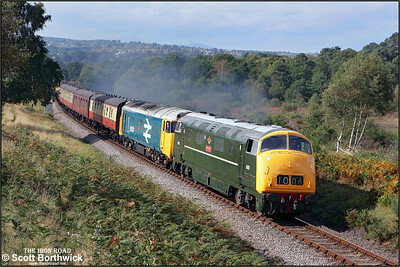 D821 'Greyhound' + 50031 'Hood' are about to enter Foley Park Tunnel with the 1129 Bridgnorth-Kidderminster service on 01/10/2004 during the Severn Valley Railways 2004 Autumn Diesel Gala. 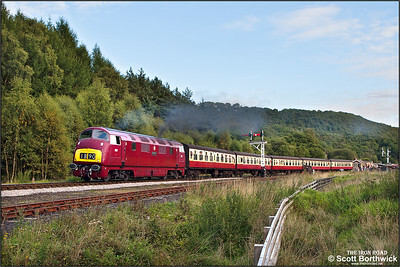 D821 'Greyhound' rolls down the bank at Thomason Foss with 2G08 1246 Pickering-Grosmont on 14/09/2013. 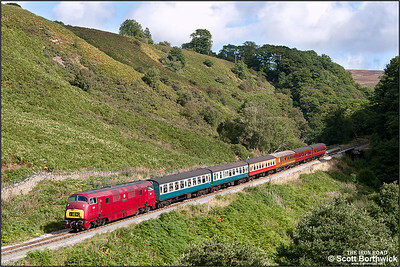 D821 'Greyhound' makes a spirited departure from Levisham with 2G16 1709 Pickering-Grosmont on 14/09/2013.